Lotus CEO Mike Kimberley reveals some of Lotus Cars’ future plans in an interview with Autocar. Kimberley says Lotus is aiming to increase it’s annual production to 8,000 units in the next five year’s time, which is double the current levels. This increase is to be spearheaded by sales of the Lotus Elise and the Lotus Europa, as well as the new Lotus Esprit powered by a BMW V8 engine coming in late 2007. Kimberley also hints that Lotus might be producing more tuned cars using donor cars by other manufacturers. Some Lotus-tuned donor cars are the Lotus Cortina based on a Ford Cortina and the recent Lotus Carlton based on the Vauxhall Carlton pictured above. I’m sure many of you remember what Lotus did to an old Lada Riva in an episode of Top Gear. If you’ve missed it, the video is available here. The Vauxhall Carlton originally had a 3.0 litre inline-6 DOHC engine. Lotus increased the stroke of the engine to 3.6 litres, and bolted on two Garrett T25 turbochargers with a water-to-air intercooler to give the engine 377 horsepower at 5,200 rpm with 557Nm of torque at 4,200rpm. They mated this to a ZF 6-speed stick shift from the Chevrolet Corvette ZF-1. 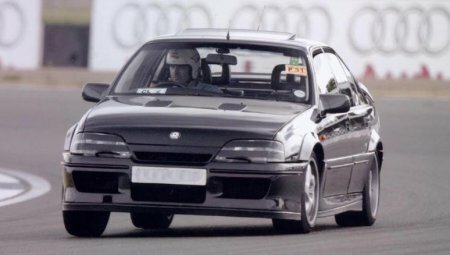 The result was the Lotus Carlton. It did 0-100 in 5.2 seconds and had a 283km/h top speed. Of course in tandem with the increased power, the suspension and brakes were upgraded. A family sedan which could go really really fast, ala BMW M5 style.